Summer 2016 will be a fantastic year for cycle touring. Myself and my friend Caroline are cycling the coast of Ireland in 2016. Partly cycling the Wild Atlantic Way route, partly cycling along our own planned roads. Rides for me so far: Quite a few to date. Audax UK Member. Rather a slow cyclist, spending more time gazing about than thrashing my bikes. Ridden several CTC’s, and one End to End (UK). Mostly ride alone, simply because I tend to favour hills, decent distances and I look so stupid with all my bags that no one can bear to cycle out with me. (I was in my Sunday Best for this pic) – plus, I hadn’t eaten cake for a week. Me: ITS AN OLD PIC OK!! This is my blog, and as I have a much younger looking companion, I need to look good here! Who can only be described as a Manx phenomenon. She carries along with her a hefty moo cycling C.V. There are not many off road tracks left in the Isle of Man or the UK for that matter, that do not have the scars of her tread marks on them. 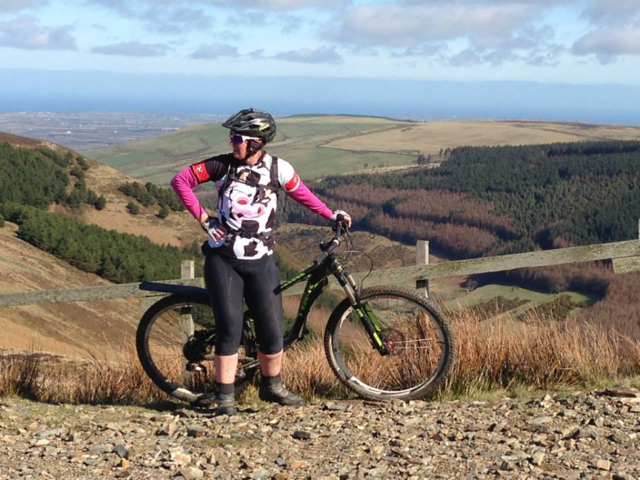 Caroline has had a huge effect on increasing the number of women taking up mountain bike riding on our Island, with training sessions, frequent off-road rides out, she has changed the lives of many of us for the better. 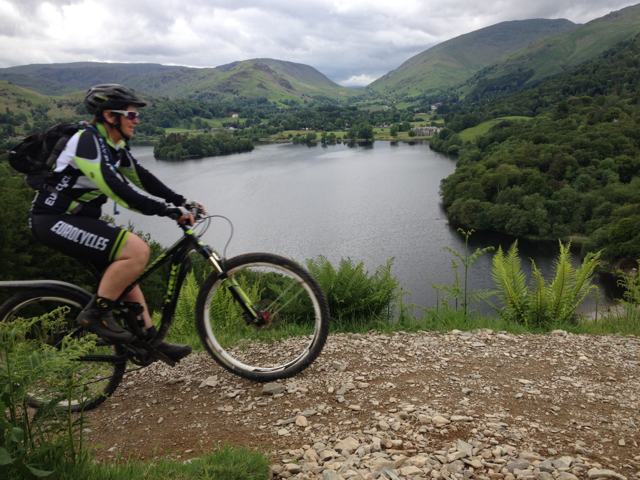 Here she is below, on her beloved mountain bike. I am soooo pleased to be sharing this ride to Ireland with Caroline. I just hope I can justify her time off the mountain-side. We will have rather a lot of tarmac between our start and finish. Caroline is also a rather nifty fell and road runner, and she swims like a fish too. So if any emergency arises, I feel confident that I can send our Caroline out there to get help! (While I eat the rest of the cake of course, and finish knitting that sock). Apt at taking on a challenge she bravely tackles anything and every thing. … anyway, I just hope our two wheeled companions keep in touch with one another along the way, as her ‘Lovely’, will be nudging onto that rough bit o’ track at every opportunity, whereas my trusty ‘Steed’ will be being a bit ‘precious’ on where her wheels roll. What does Caroline not do: Caroline has not yet ventured to the Moon as far as I’m aware. Scratches chin, did I hear somewhere……? but lets not remind her of this fact, or we might not have the pleasure of her company for some time me thinks. Shedman (hubby dearest) said I was not to tell Caroline about this kinda thing… but thankfully its not in Ireland – I’m safe! Dont Tell Caroline about this!